The technically advanced micro fibre of the new Sleep Skin is designed to be used ‘next to skin’. Its remarkable thermal properties work by trapping warm air next to the skin. Remaining highly breathable, sweat is "wicked away" allowing ideal levels of body heat to be maintained. 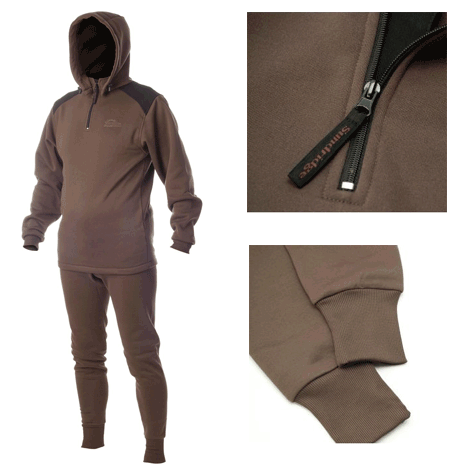 SUPPLIED IN Three pieces: A pull over hooded top with a zip up neck and Trousers with elasticated waist and ankles, and now with a Blaclava Size chart Guarantee Sundridge clothing comes with a two-year guarantee against fair wear and tear. To activate this fill in and return the gaurantee card supplied with each piece of clothing. All Sundridge clothing is guaranteed 100% WATERPROOF. Sizing Chest: Measure around fullest part ensuring tape is placed under shoulder blades. Waist: Measure around natural waistline ensuring tape is comfortably loose. Care of clothing We have taken care to produce garments made from quality fabrics. Please be sure to follow cleaning instructions carefully. These instructions can be found labelled inside the garment. FREE Delivery on all Sundridge Jackets / Suits / Shirts / Bib n Brace / T-Shirts over £100!! !